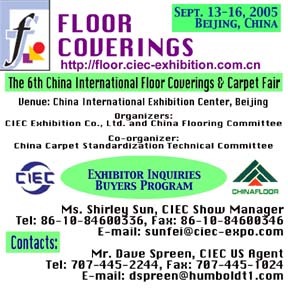 January 24, 2005 (Beijing) - The Chinese International (CIEC) Exhibition Company has announced an Industry Delegation Program will be offered for the 6th China International Floor Coverings and Carpet Fair to be held September 13-16, 2005 at the China International Exhibition Center in Beijing. For more information on the 6th China International Floor Coverings and Carpet Fair (Floor Coverings 2005) contact CIEC's US agent Dave Spreen by phone 707-445-2244 or email mail@davespreen.com. Exhibition websites can be found at http://floor.ciec-exhibition.com.cn and http://www.davespreen.com/china/fc2002. Also see the pictorial from 5th China International Floor Coverings and Carpet Fair Newsletter.